Enjoy a quick and easy way of receiving your contact lenses regularly, without having to go online or re-enter your order with our convenient Auto-Replenish service. To activate your Auto-Replenish, you will need to order a minimum of €20. After you have added your contact lenses to the basket, simply opt in to Auto-Replenish at the check-out page. Your order will be sent out regularly at the set interval that you specify and the minimum interval that you can set is, every 25 days. Automatic Ordering – you don't need to remember to top up your supplies, we can do that for you! Log into 'My Account' and click on the Auto-Replenish tab. All you need to do is select ‘Auto-Replenish’ on any of your previous orders. To manage your Auto-Replenish orders, log in and go to the My Account section. 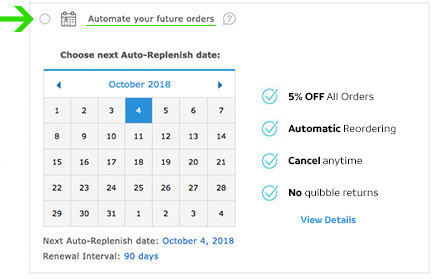 From the ‘Auto-Replenish’ tab, you’ll be able to review your orders and change the schedule and/or frequency of your deliveries. If you want to change the products, payments details or prescriptions listed; you’ll need to cancel your Auto-Replenish order and create a new one with your preferred details. For further details, view our full terms and conditions.